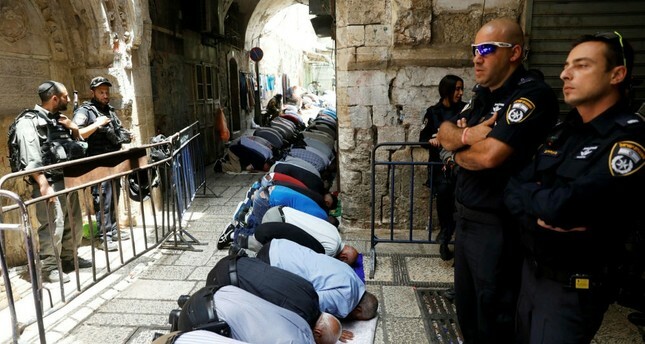 Israeli activists storm Jerusalem holy site after Al-Aqsa crisis COMPILED FROM WIRE SERVICES ISTANBUL Published Palestinian men pray as Israeli security forces secure the Al-Aqsa mosque compound in Jerusalem's Old City, July 26. More than 1,000 hardline Israeli activists, guarded by police, yesterday toured a flashpoint Jerusalem holy site that had been the focal point of recent tensions in the city. According to Firas Dibs, spokesperson for the Waqf, the religious authority in charge of Al-Aqsa mosque, 1,089 " extremists stormed" the site. According to The Jerusalem Post newspaper citing figures released Monday, there has been a 15 percent increase in the number of Jewish visitors to the site in the past year. Amid more restrictions imposed on Palestinian entry to the mosque, hundreds of Jews have ascended a contested Jerusalem holy site to mark Tisha B'Av, the Jewish day of mourning over the destruction of the biblical temples. Police spokeswoman Luba Samri said six Jewish visitors were removed for violating the guidelines as the group reportedly called to intensify the daily raids on the mosque. She also said three Jews and one Muslim were arrested after a minor skirmish. Azzam Khateeb, director of the Muslim administration, the Waqf, said, "This is unprecedented, unacceptable and should stop." The Israeli government has overlooked the violations by the settler groups in East Jerusalem's flashpoint Al-Aqsa Mosque compound despite the call s from the Temple Mount administration and Palestinians. The Temple Mount is central to the Israeli-Palestinian conflict, with Palestinians fearing Israel may one day seek to assert further control over it. It is located in east Jerusalem, which was occupied by Israel in 1967 and later annexed in a move never recognized by the international community. It is considered the third holiest site in Islam and the most sacred site for Jews. Jews are allowed to visit the compound but cannot pray there to avoid provoking tensions. The site has been at the center of recent tensions after Israel installed, and then removed, metal detectors there following the deadly shooting of two Israeli policemen. Muslims administer the compound, home to the Al-Aqsa and Dome of the Rock mosques, while Jews can visit but not pray there. Anger has spilled across the West Bank since Israel shut Al-Aqsa Mosque compound following a deadly shootout on July 14. The site is venerated b y Muslims as Haram al-Sharif, or Noble Sanctuary, and Jews, who call it the Temple Mount. The mosque was reopened after two days, with Israel installing metal detectors and cameras at its gates. Protests and deadly unrest erupted in the days after the measures were installed, with clashes breaking out around the compound in Jerusalem's Old City, in the occupied West Bank and in the Gaza Strip. Seven Palestinians were killed as a result of the clashes, in addition to dozens of wounded. Three Israelis were also killed in an attack in a settlement on the West Bank. The mosque was reopened after two days, with Israel installing metal detectors and cameras at its gates. Despite calls from the Islamic world to not to offend worshippers and return to the status quo, Israel refused to remove the detectors, claiming the security measures were similar to procedures taken at other holy sites around the world. But facing international criticism and pressure, I srael's Security Cabinet decided to remove the metal detectors. A statement released after the meeting said a new surveillance system using "smart checks" based on advanced technology would be put in place.